Pinnacles National Park centers around a bunch of rugged red rocks in California. Those rocks are all that's left of a 23,000,000-year-old volcano. Called Neenatch, it once stood 8,000 feet high — and 195 miles south. The San Andreas Fault ripped the old volcano in half and took the rocks for a millions-of-years-long ride to today's location. According to the National Park Service, they're still moving - about an inch per year. At that rate, they'll be near where San Francisco is now in another 6 million years. That's pretty impressive, but it's not all. Pinnacles National Park is a scenic spot that is popular with hikers, rock climbers, and animal watchers. Campers enjoy its dark nighttime skies. It's also popular with families and day trippers from the San Francisco Bay area. The west entrance offers spectacular views of the rock formations from the parking lot, and it has the easiest hike: a 2.4-mile round-trip loop. Even if you only spend 5 to 10 minutes on this trail, the scenery is so spectacular that you'll be glad you did. The east entrance near Hollister is best if you plan to camp overnight or visit Bear Gulch Cave. There's a small nature center near the parking area. Hiking: The park has more than 30 miles of trails. They range from easy, flat walks to strenuous climbs. Park rangers can help you choose the best one for you. Rock climbing: Climbers enjoy the Pinnacles' rock formations. Caves: Pinnacles has two tunnel-like caverns that were created when massive boulders fell into a narrow ravine. They're a feature some children especially love. Bear Gulch Cave is near the east entrance. The Balconies Cave is reached by hiking from the west. The caves are sometimes closed to protect resident bats or because of floods. Wildflowers: Some years, wildflowers put on an enthusiastic display at Pinnacles. In fact, it's the only time of year that the park gets crowded. Evening programs: Rangers put on full moon and dark sky hikes. Bat viewings and astronomy programs happen on selected Fridays or Saturdays spring through fall. You may need to make reservations. California condors are the "rock star" animals at Pinnacles National Park. You can often see them soaring far overhead on their 9.5-foot wide wings, looking for food. Townsend's big-eared bats live in the Bear Gulch Cave. Western Mastiff Bats are in residence around the Balconies Cave in ​the spring and late summer. To protect females and pups, rangers may close the caves from mid-May through Mid-July. Bees: Of all the animals found at Pinnacles, the bees may be the most interesting. Some 400 species arrive in late spring to feed on the blooming wildflowers. They range from the size of a mosquito to the size of a peanut shell. If you go at the right time, you could see more than 200 kinds of the buzzing insects just by hiking 2.3 miles on the Old Pinnacles Trail. Bring a flashlight - you can't go into the caves without one. And after it rains, dress for a mess. The caves get wet and muddy inside. Bring binoculars, just in case the condors are around. Bring all the food and water you need. There is no food concession at the park.The visitor center sells bottled water and flashlights. Bring sunscreen, even in winter. You'd be surprised how fast you can get a burn on a cool winter day. Dress in layers. Sun, shade, and wind combine to produce big temperature swings, even when you only walk a short distance. Those spiky chaparral plants covering the landscape are the reason cowboys invented chaps. Your legs will thank you if you wear long, thick trousers. Wear sturdy shoes to hike or go into the caves. Leave Bowser at home. Pets aren't allowed on the trails. Watch out for poison oak and stinging nettle along the trails. They can turn a fun day into an unpleasant one if you're allergic. If you don't know what the plants look like, learn before you go. Pinnacles is an easy day trip from the Bay Area, but there are a few options if you want to stay overnight. The only campground is near the east entrance. It has RV, tent, and group camping sites, a convenience store, swimming pool, and hot showers. Reserve through recreation.gov, well in advance. Inn at the Pinnacles bed and breakfast is near the west entrance, and you can also find a few places to stay in nearby Hollister. The park is open daily, but the west entrance parking lot closes nightly. After that, you can exit but can't get in until the following morning. You will pay a small per-vehicle entrance fee, except during the annual National Parks Week in April. Entry is also free on selected other days that vary by year. Allow at least an hour for your visit. It may take longer, depending on where you plan to hike. 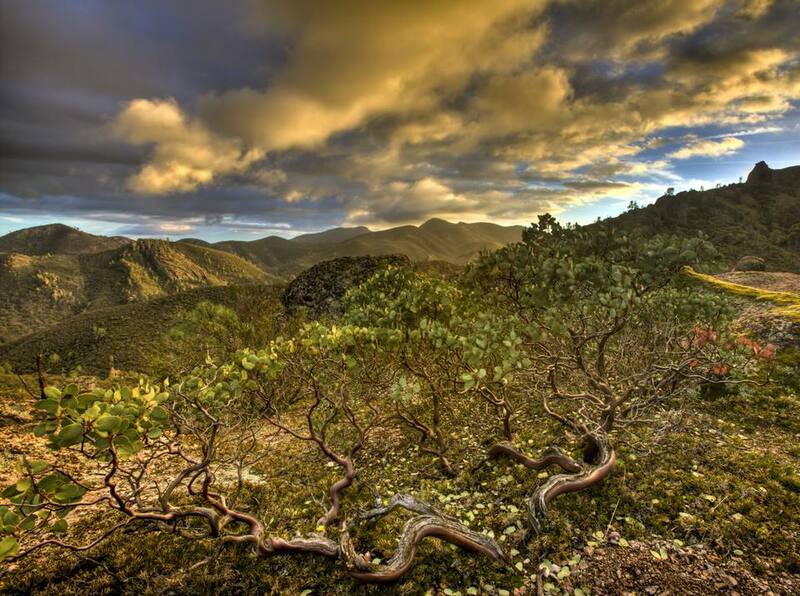 Spring, fall, and winter are the most popular times to visit Pinnacles National Park. Summers are hot (over 100°F) and dry. It's also very busy during spring weekends. Pinnacles National Park is located at 5000 Highway 146 in Paicines, CA, about 90 miles south of San Jose. The two entrances are connected only by hiking trails. To reach the East Entrance go through Hollister about 30 miles, then turn right onto CA Hwy 146. To get to the West Entrance, take US Hwy 101 to Soledad, then follow the signs for 14 miles. The winding, sometimes one-lane road is not suitable for big RVs. If you're driving from one entrance to the other, the shortest route between them is through the town of King City and takes about 1.5 hours. Where Is the Rest of the Pinnacles? The San Andreas Fault carried the most scenic part of the Neenach Volcano northward, but the rest of the Neenach Formation is near Gorman, just north of Los Angeles. It is just beyond Three Points on the Oakdale Canyon Road and on private property. According to the book Magnitude 8, it is the only other place where the same kind of rocks are found.